Has success gone to the head of this family favourite? 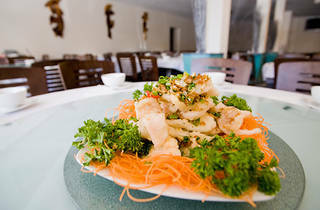 Having been around since 1982, Bach Dang has gone from being one of the many Canley Vale Vietnamese joints lining the main drag of Canley Vale Road to claiming brag rights as the popular restaurants in the suburb. Because of its success, Bach Dang looks more like one of those big Cantonese palaces in Chinatown than any hole-in-the-wall Vietnamese restaurant you'd be likely to come across around Sydney. It means on one hand, you're in a somewhat nicer room than your average laminex and paper towel emporium. On the other, the food lacks cut-above personality. 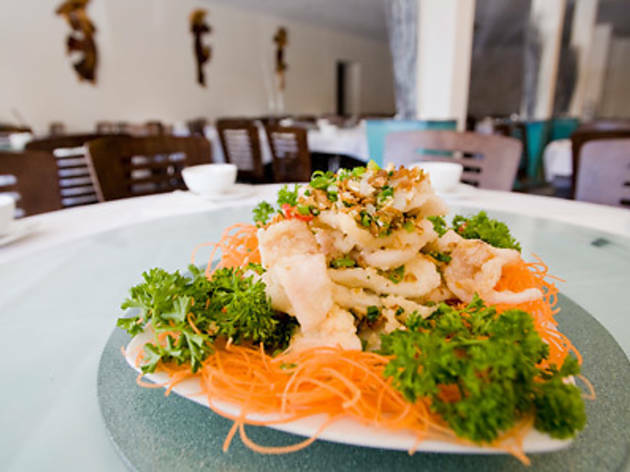 But it's not all bad news - there are some outstanding dishes on the menu, like the ultra-light garlic and butter squid, served with a peppery lime juice and fish sauce. Here tender triangles of squid are coated in a crisp batter. There's a wonderful stir fried eel with lemongrass, too. But the real winner here is the sweet, rich and gamey roast pigeon, served beaked head and all, sliced so it looks to be doing some sort of complicated yoga position. Less impressive is the slightly mushy-of-flesh and overly-sweet tamarind mud crab which lacks that bitter tang that tamarind should have. The crab also lacks the sweetness we come to expect from crustaceans. Roast chicken wings stuffed with pork mince - a labour intensive job that involves removing every bone from the wing - could do with an injection of pork fat and salt to liven the act up. Snow pea sprouts sautéed with plenty of garlic save the day though, as does the fact that they do lemon soda (soda chanh) by the jug (huzzah!). It's served with the juiciest rockmelon we've eaten all year. Bach Dang's food is generally good - albeit inconsistent - but take us to a regular mum and dad operation any day. We think these guys are a little too big for their boots.